Juan Beniquez was one of many great position prospects for the Red Sox in the early 1970s, beginning his career as an infielder. After switching to the outfield he was faced with a logjam of star talent, necessitating that he leave Boston to finding regular playing time. Through it all, he managed to play parts of 17 seasons for eight American League teams. He played in a World Series, won a Gold Glove, and hit three home runs in one game. Juan Jose Beniquez Torres was born on May 13, 1950 in San Sebastian, Puerto Rico and signed with the Red Sox at the tender age of 18. He made his major league debut as a shortstop only three years later, on September 4, 1971, coming in to play in the eighth inning and grounding out in the ninth. But he had a great game the next day, in his first major league start, batting 3-for-4 with two doubles and driving in two runs as the Red Sox beat the Indians, 8-1. Beniquez played a lot of shortstop for the rest of 1971, alternating with incumbent Luis Aparicio, but he didn't make the team out of spring training in 1972. He was called up in June when Aparicio was disabled due to a broken finger, and played daily until he set a modern major league record with six errors in two consecutive games in July of 1972 (making it a total of seven for three consecutive games). Aparicio returned in August, and Beniquez rode the bench for the rest of the season. He did play in the 1972 season finale that the Red Sox won, leaving them a scant 1/2 game behind the division winning Detroit Tigers. 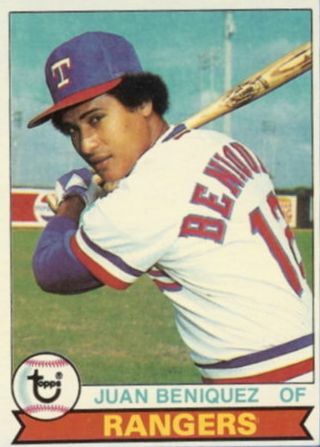 Beniquez was slated as the Sox utilityman for 1973, but Mario Guerrero's strong spring training won him the slot, and Beniquez was assigned to Pawtucket where he started off at shortstop but was ultimately moved to the outfield. He spent the entire 1973 season at Pawtucket refining his outfield play. Though hitting only .298, he led the International League in batting. In 1974 Beniquez was the Red Sox center fielder on Opening Day, and ended up sharing the position with Rick Miller, playing 106 games (91 in center field), and batting .267. He normally hit first or second in the batting order, though he did not get on base very often for a player with such a role. The 1975 Red Sox outfield was a logjam from the start. To incumbents Beniquez, Miller, Dwight Evans, and Bernie Carbo were added rookies Fred Lynn and Jim Rice. Despite this, Beniquez won a job in the spring, starting the first four games of the season (two in left field, two in center field) as the team's leadoff hitter. With the emergence of Rice and Lynn early in the season, Juan soon found himself in a reserve role. Manager Darrell Johnson used his entire roster, so Beniquez played a total of 78 games, mostly in the outfield (44 games), but he also filled in at third base (14 games) and at designated hitter (20 games). Despite his limited playing time, Juan had a solid .291 batting average, but a mediocre .760 OPS, reflecting his meager two home runs on the year. With Rice hurt and inactive, Beniquez batted leadoff in all three games of the 1975 ALCS sweep against the Oakland Athletics, as the DH. He went 2-for-4, scoring one run and driving in another in Game One. He singled in Rick Burleson in the seventh, then proceeded to steal second, then third base; he scored after Billy North muffed Denny Doyle's sacrifice fly. He ended up hitting .250 for the series. In the World Series, without the designated hitter in effect, he appeared in just three of the games. He was a surprise starter for Game Four, leading off and playing leftfield, as Yaz moved to first and Cecil Cooper was benched. He managed one single in that game, but was held hitless in three at-bats in Game Five. His final appearance was as a pinch-hitter for Rick Miller, leading off the bottom of the ninth in Game Seven, where he flied out to right field as the Sox failed to overtake the Reds for the final loss. After the 1975 season, it was clear that Beniquez would not have a big role in the future of the team. Right or wrong, he had also acquired the tag of having an "attitude problem." In November he was dealt, along with Steve Barr and a player to be named later (which proved to be Craig Skok), to the Texas Rangers for future Hall of Fame pitcher Fergie Jenkins. For Texas, he was the biggest part of the deal, and he became the regular centerfielder in 1976. He was a prototypical "all glove, no hit" player, as he was rewarded with the Gold Glove for his centerfield play in 1977, but he hit only .269 with ten home runs and 26 stolen bases. After three years starting with Texas, in the winter of 1978 he was part of a huge multi-player deal, in which Texas sent him, Mike Griffin, Greg Jemison, Paul Mirabella, and hot minor league lefthander Dave Righetti to the New York Yankees in exchange for Domingo Ramos, Mike Heath, Sparky Lyle, Larry McCall, Dave Rajsich, and cash. After appearing in only 62 games for the Yankees, he was dealt the following winter to the Seattle Mariners. After one year and 70 games for the Mariners, he was granted free agency and signed with the Angels. After a couple of tough years in California (including hitting a mere .181 in 1981), Juan finally found the hitting stroke he had shown as a minor leaguer, hitting over .300 every year between 1983 and 1986, the last of which was for the Orioles. During that single year in Baltimore, he had one of the more unlikely three-home run games, as he hit fully half of his six home runs on June 12, in a losing cause against the Yankees. Dealt to Kansas City in December 1986, and then to Toronto in July 1987, Beniquez hit just .251 combined for the season. In January 1988 Beniquez (and six other players) were granted free agency by a judge who ruled that the owners had conspired to hold down players salaries after the 1985 season. He elected to remain with the Blue Jays, but was released after just 58 at bats in 1988. His career over, he held the record for having played for eight American League teams. After parts of 17 years in the big leagues, an American League championship ring, a Gold Glove, and experiences all over the country, Juan Beniquez could retire with a lot to be proud of. But he was not through. In 1989 he hit .359 for the St. Lucie Legends of the short-lived Senior Professional Baseball Association. With that league's demise the following season, he was finally through. A version of this biography appeared in "'75: The Red Sox Team That Saved Baseball" (Rounder Books, 2005; SABR, 2015), edited by Bill Nowlin and Cecilia Tan. It also appears in "Puerto Rico and Baseball: 60 Biographies" (SABR, 2017), edited by Bill Nowlin and Edwin Fernández.